You have probably heard the saying, “A picture is worth 1,000 words.” That is the basis for a Visual Workflow where a process is documented with added visual aids. 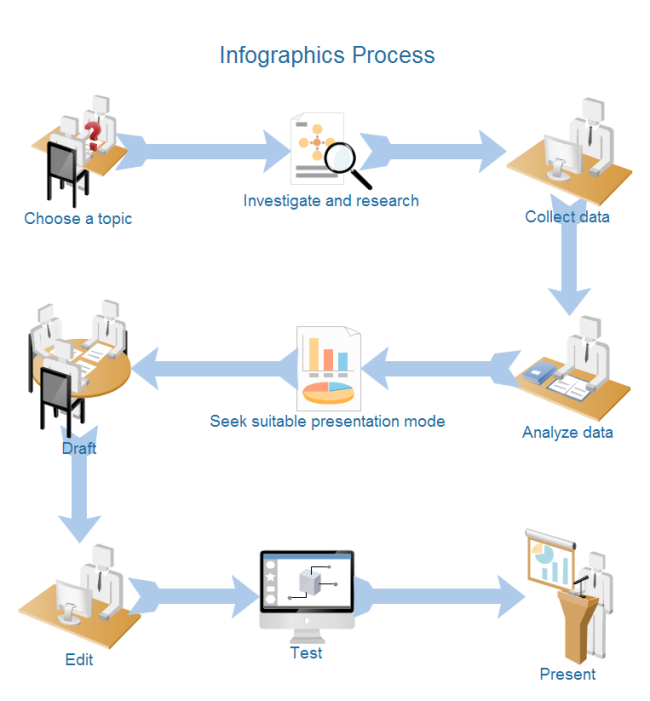 Pictures or graphics are used to document the steps in a process along with explanation text. There are many types of images used in visual workflow tools such as graphics, flow chart symbols and pictures that depict the flow of work instead of writing the process paragraph after paragraph. No matter what your employees’ language or education level, it is likely that they will better understand a visual workflow as compared to a multipage written procedure. This tool is particularly advantageous to companies that have workers with differing primary languages for that very reason. We will discuss each of these benefits and look at a few examples of three different types of visual workflow tools. As with any type of process documentation, one benefit of visual workflows is increased standardization. When the process is clearly defined and documented, then workers can repeat the process the same way each time. The sequence of steps is obvious and easy to duplicate. Also, when work is done by more than one person, there is a standard for all to follow which increases the likelihood of completing the work in the same way which ultimately drives the achievement of the intended results. This first example of a visual workflow employs graphics to depict the various steps in this process. This workflow diagram makes the steps very clear. Employees can see the various tasks and will readily know what they are and in what order they are to occur. It provides a high-level view of what activities are included in this process and makes completing them in correct sequence easy to do right. This type is best used when an overview of a more complex process is needed. 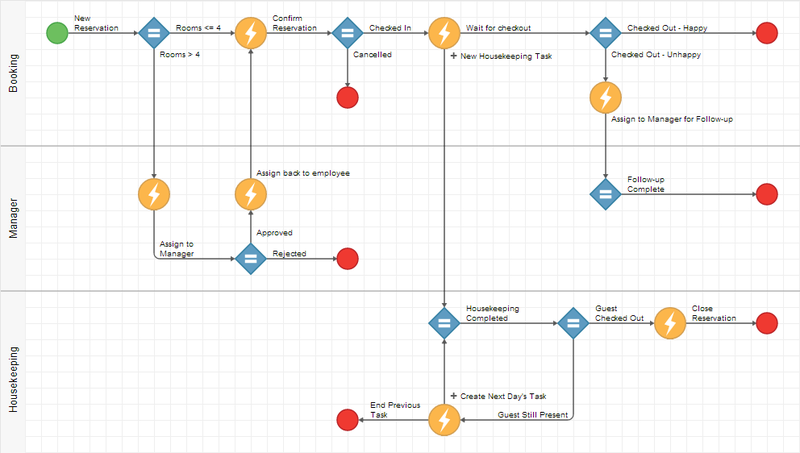 Flowchart symbols presented in a “swim lane” workflow more easily depict the interaction between employees, department or functions. Each participating group, person or function is represented in the left column and any tasks for which they are responsible will appear in their lane. This example is part of a work flow that was created in a swim lane style. With this type of visual workflow, it is easy to see the interaction required from the Booking function, the Manager, and the Housekeeping staff. In this example, the Booking department is placed in the top lane, which is usually reserved for the department who completes the most tasks in the process. This type of visual workflow is a good choice when there are several departments involved in the same process. For a more detailed work instruction, a photograph based visual workflow may be the most beneficial. It can be very advantageous for employees to see pictures of what is supposed to happen during their task. This type allows authors to use pictures of actual parts or materials to demonstrate the correct way to conduct activities. 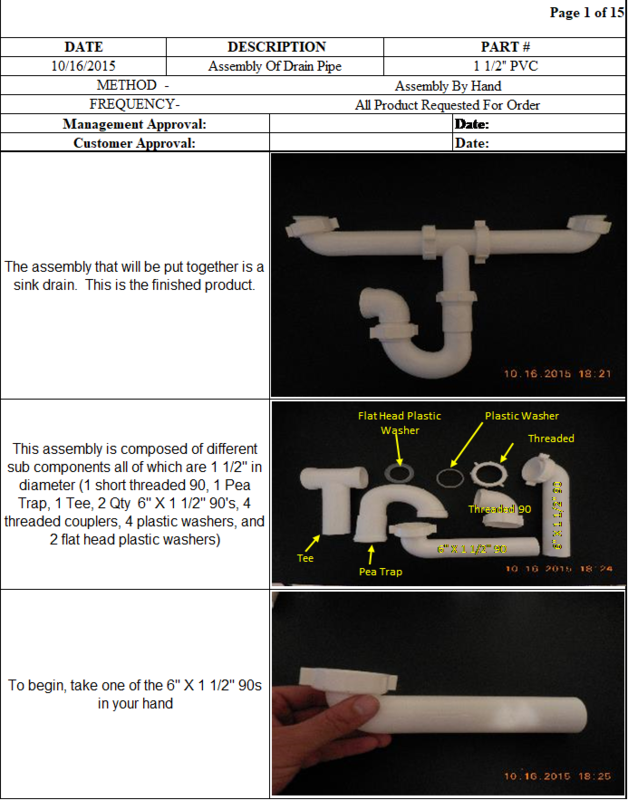 Below is a part of a visual work flow that incorporates photographs that show the correct way to assemble a part. It begins with a picture of what the final assembled part looks like and is followed by the individual components and their names. You can see that there is text associated with each photo to provide more guidance to users. This type of workflow is helpful for detailed work instructions. Written procedures of all types are famous for stating what should be done, but they don’t always describe what should not occur during the process. 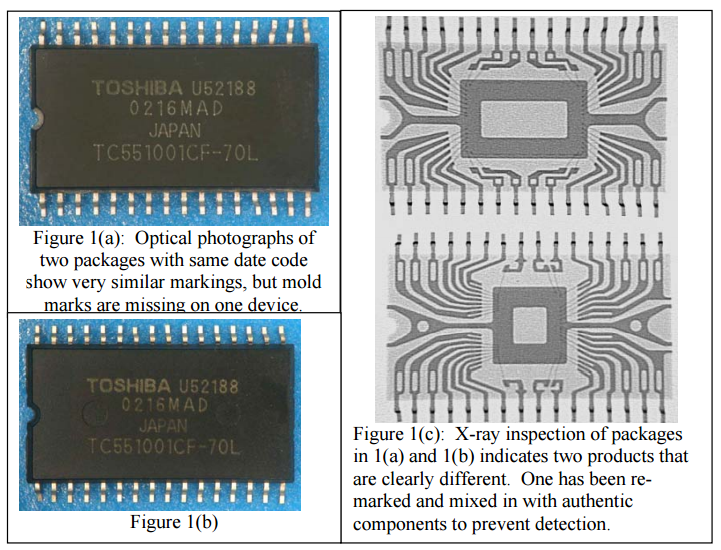 In certain cases, it can be very advantageous for employees to see pictures of what an error looks like, so they fully understand possible errors that can occur. This helps to eliminate errors. Here are some pictures that show employees examples of two different products. Each has a photo of a correct and incorrect part. You can imagine the value of showing these potential errors and how that would help to educate workers on possible problems and enhance their ability to avoid them. Visual workflow tools can be based on graphics, flowchart symbols or photographs, and the benefits are similar. Processes are more likely to be standardized- meaning they show the expected order of steps and help ensure that they happen the same way each time no matter how many different people are performing the tasks. Another benefit to visual workflows is the option to depict the participants in the process and which tasks are to be completed by each. For detailed work instructions, a visual workflow with photographs can provide excellent clarity on what is to be done and what is to be avoided. You can decide which of these visual workflows best fits the needs of your company. Just be aware, that written procedures do not always have to be in paragraph form.